Good News Bus Conversion | The Bus Life: F.A.Q. Q. How much did the Good News Bus project cost? A. We estimate that this project cost approximately $25-30,000. I hope that this does not discourage anyone interested in doing a similar project. Keep in mind that we spared no expense when it came to the real oak paneling, Fridge, Water Heater, Stove, Hood Vent etc. It is possible to do it simpler and cheaper. Q. Why didn't you just buy a Motor Home? A. It is true that this was a costly project BUT there are many benefits to being able to build your own custom motor home. We have a big family so I wanted us to be comfortable while traveling. This is the reason for a good sized Master Bedroom, a bunk room that sleeps 4 and a dinning table that sleeps two (we haven't had to use it yet). The Good News Bus will very comfortably sleep 8. As far as I know that is rare to find in a motor home. Not to mention all the other great benefits and extras that you can throw in to mold to your tastes. Besides, it would be difficult to find a nice RV for the amount that went into this project. Q. How much did the bus cost? A. The bus cost $3,000. Looking back I think that it was a little much. I have since heard about school auctions where you can pick up newer buses for as cheap as $900. Take your time and you may find a deal. Q. What gas milage does the Good News Bus get? A. The Bus has a International Diesel 466. We have traveled about 3,000 miles so far and the bus gets around 8 MPG. It does not seem to matter if we are towing or not. Q. Isn't the Good News Bus to heavy with all that extra building material? A. Short Answer: No! A school bus is built like a tank. They are one of, if not the safest and most durable vehicles on the road. They are far safer then an RV. Consider this: The Good News Bus was a 72 passenger school bus. Let's just make a very conservative estimate that each of the 72 passengers that the bus is capable of carrying weighed only 75 pounds each. That's 5,400 pounds. Each of the 36 seats that were removed weighed at least 50 pounds each. That's 1,800 pounds. So that is a total combined weight of 7,200 pounds. That gives a lot of weight to work with. Besides that, we weighed the bus after the project was complete and we still under weight! Q. What are the size of your bunk beds? A. The bunk and mattress size is 26 1/2" x 78"
Q. Is there anything you would change or do different? A. 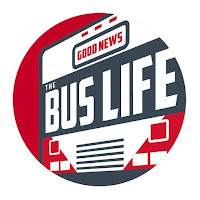 As great as the Good News Bus turned out there are a few things I would have done different. I know this adds some extra work but I think the rewards would be worth it. It isn't like it is a terrible thing having a 6' 2" roof but the bus would feel a lot bigger had I raised the roof even an extra foot. If you are doing a project like mine I would recommend doing this. More then anything I think it would raise the resale value should you decide to sell it. If I could do it over I would have covered all the bus windows and then put in RV windows. There are many benefits to this including energy (Heat & A/C) efficiency. This is a project I will more then likely tackle in the future. One of my main reasons for removing the front stock heater was because I wanted to cover the whole dash and it was just easier to do that with much of the heating system gone. My thinking was also the fact that the heating system was old and the levers and knobs where wore out. We traveled in some VERY cold weather (-25 C) and I was wishing I had that extra heat. If I could do it over I would have taken more time to see if there was a way to work the old system into my plans. I used CPVC for all water lines. CPVC is not at all forgiving in the cold and it is less flexible then PEX. If I ever do a second project I will use PEX. 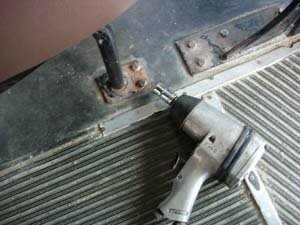 I have done the best I could to lay out a step by step guide to converting a School Bus into an RV through the Good News Bus blog. What I hope to do with the following is give a list of tools that you will need to have available in order to get the job done. The items I will be showing you are brand new items and are just for reference. Used items will work just fine. 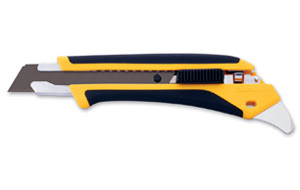 A Tape Measure is also one of the first tools you will need. 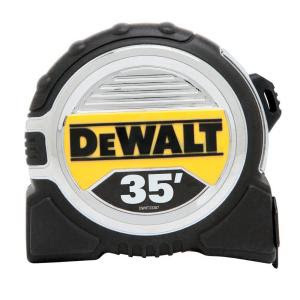 The DEWALT 35 ft. 1-1/4 in. tape measure will allow you to measure nearly the full length of your bus. Depending on how you choose to remove your seats you will need one of two things. 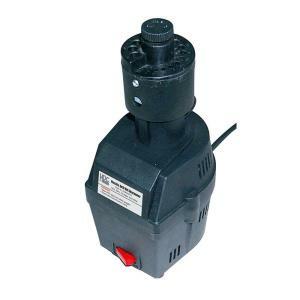 An air powered impact driver like this. 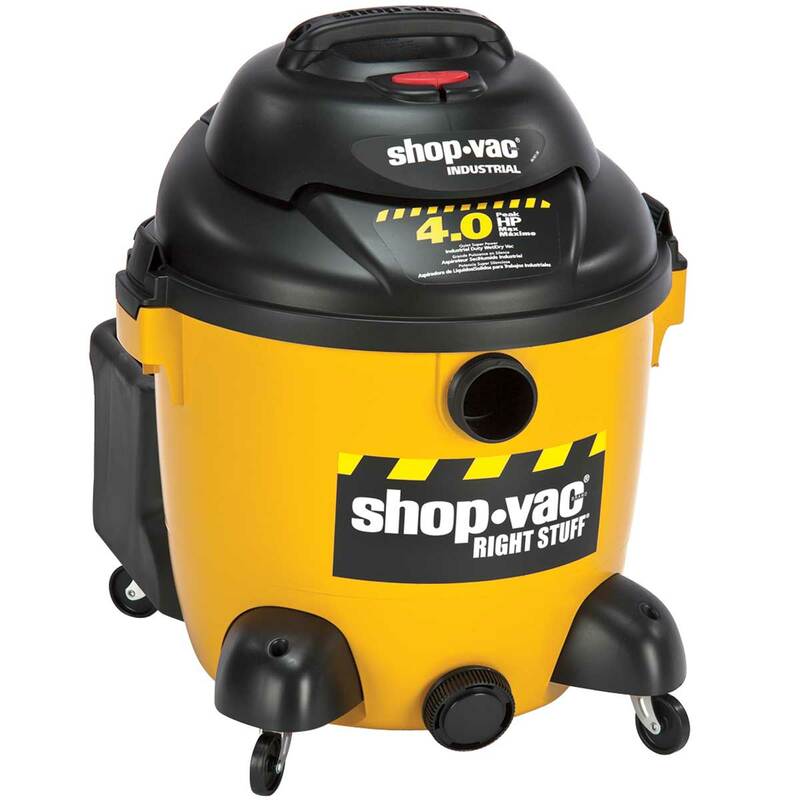 If you go with an air powered impact driver don't forget you will also need an impact socket set, an air compressor and an air hose. 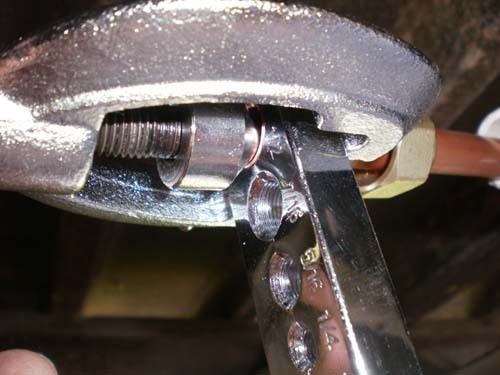 The second option is using an angle grinder to cut the bolts away. This second option may prove to be the quickest. Make sure and purchase some good ear protection. This DeWalt D28402 Angle Grinder should do the trick. 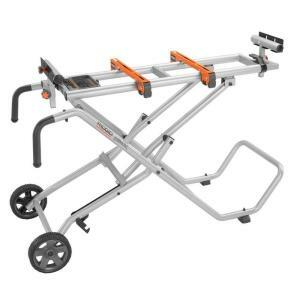 I used the Ridgid OL50145MWD 5 Gallon Mini Wheelbarrow Compressor. It is very easy to move around and keeps up pretty good. 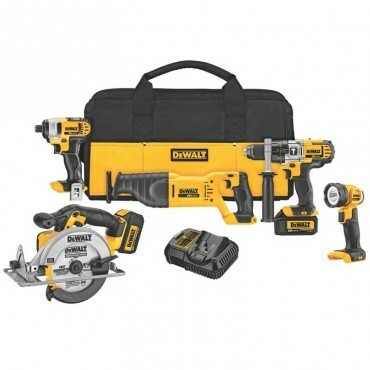 The DeWalt DCK590L2 20V Max Li-Ion 5-Tool Kit would provide the majority of the tools you would need for a bus conversion. I just purchased this kit and am enjoying it. 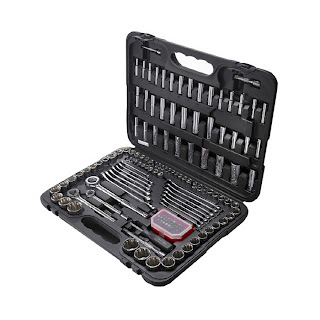 You will need to use most of the tools in this kit. I used a long steel pry bar for removing all the old plywood that was under the rubber mat. It made the job quicker and easier. Mops and cleaning supplies are a must. A Shop Vac like this is pretty much required. A work light like this will help with those late hour working stints. A Ladder like the Werner 8 ft. 250 lb. 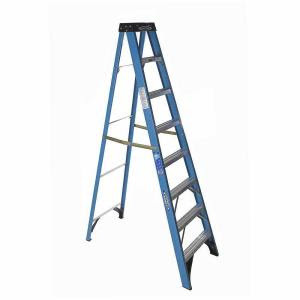 Fiberglass Step Ladder will probably be a must. You will need lots of drill bits. 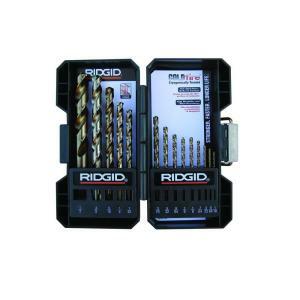 I went though many drill bits and latter on in the project purchased the RIDGID Cobalt ColdFire 14-Piece Drill Bit Set. The bits seemed to last longer then all the other bits I had tried. 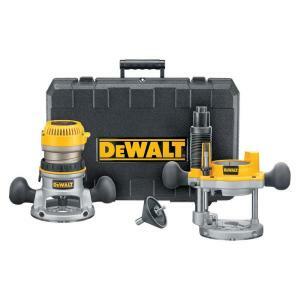 When the drill bits get dull it isn't a bad idea to invest in a drill bit sharpener like the Professional Woodworker Electric Drill Bit Sharpener. It will end up saving you money. For all the hole cuts I had to make I used a Lennox hole saw Kit and was really impressed with the performance. 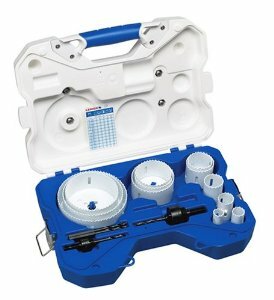 The Lennox 308021200L kit should give you every hole saw required for your project. 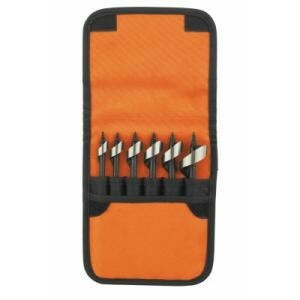 When you need to cut a smaller hole into wood the Ridgid 6-Piece Auger Wood Bit. 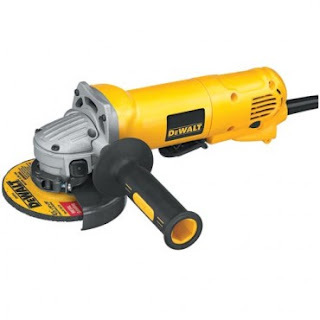 The nice thing about these is when you start to drill a hole because it has a screw tip on the front it literally pulls the bit through the wood with minimal effort. 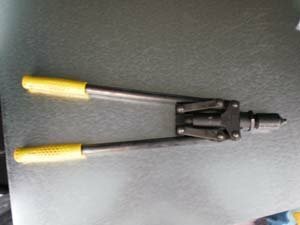 If you plan of cutting any metal you will need a good pair of metal snips. 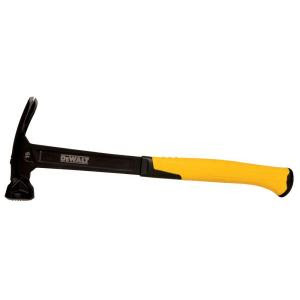 A hammer is also a must. 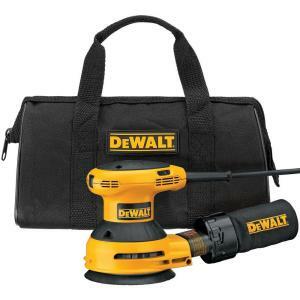 I have used the DEWALT Steel Mig Weld Hammer. 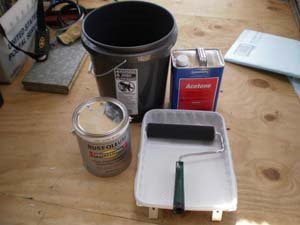 Paint Supplies. I used foam rollers for the whole project. Large foam rollers for the roof and smaller rollers for the body. Once you get to the framing/trim stage you will need a chop/slide saw with a good blade. 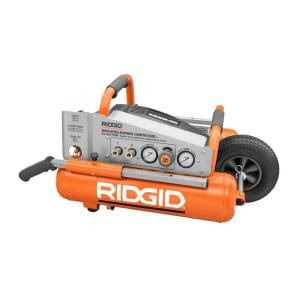 I used the RIDGID 12 in. Sliding Compound Miter Saw. It worked great for the entire project. 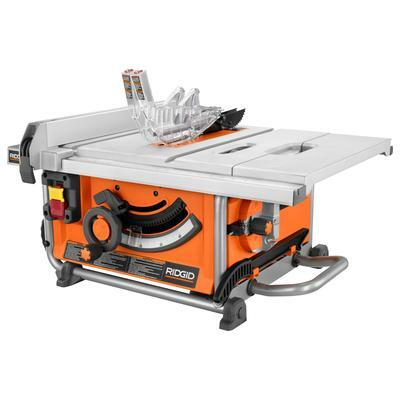 I also recommend the Rdgid Miter Saw Stand. But a friend of mine has the DeWalt DW745 Portable Table Saw and there are many features on it that I like as well. You can't go wrong with either. Another power tool that was needed was a router. 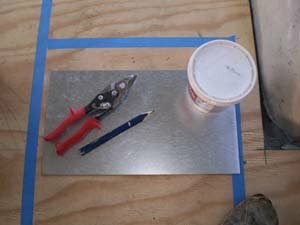 I mainly used the router to put a nice edge on the kitchen table and a few other places. It helps add character to your project. A DeWalt DW616PK will do the job. A brad nailer is going to be needed for nailing the paneling in place. 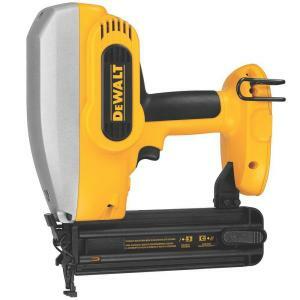 I used a Porter-Cable brad nailer but later was able to obtain a DEWALT 18-Volt Cordless 2 in. 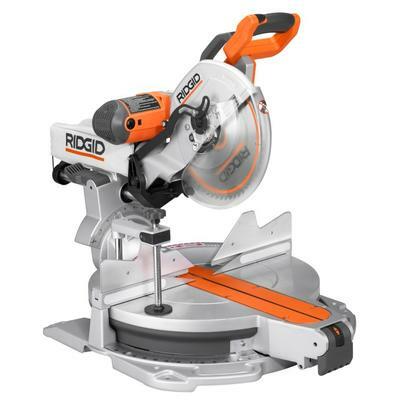 18- Gauge Brad Nailer. 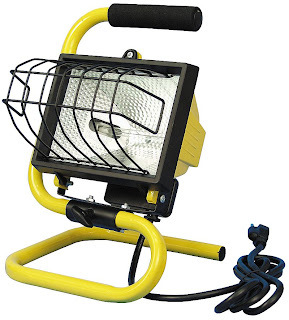 It works great and you don't have to use a hose or compressor with it! When you start getting to the electrical part of the project a good set of wire cutters/strippers are a must. 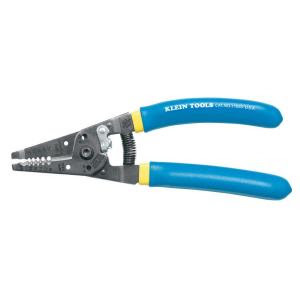 The best I have found are the Klein Kurve Wire Strippers/Cutters. 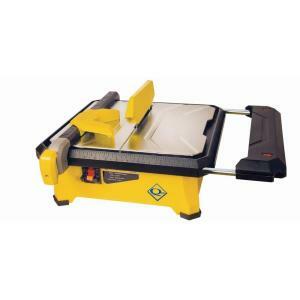 If you are planning on doing any tile or stone in your project like I did you will need a Tile Wet Saw. 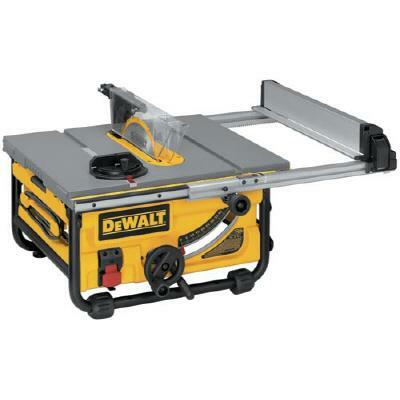 I used just a lower end saw like the QEP 650XT. It's a 7" 3/4 horse power and will work fine for small jobs. One of the things I would do different is using PEX for the waterlines rather then CPVC. 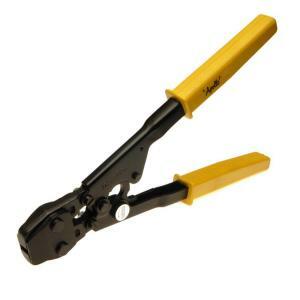 If you use PEX you will need a crimping tool like the ApolloPex Quick-Cinch Crimping Tool. Really nice conversion, some campgrounds don't allow school bus conversions have you ever had a problem? So far we have had no issues. The bus from nose to rear is 35'. We found the bus on eBay. Hey, just looked at your blog and its beautiful. Just wanted to know where you put the propane tanks and the black water tank? Thanks. Beautiful job! I too love such seemingly impossible projects. My wife and I did a similar conversion with a '73 Winnebago. What a flop. The chassis was simply not worth the effort we spent, not to mention the money, on the remodel. I swore the next conversion would be with a coach. Do you find the school bus chassis to be adequate? I would think it would be low geared and a very stiff ride. It is a very well done job. Being a child of the Trinity myself, I believe I know how God felt when he looked over all He had created and saw that it was good. 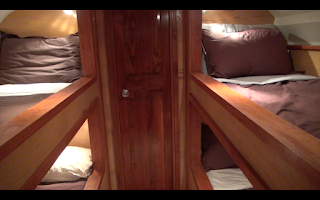 Did you have to custom order mattresses for the bunks? We plan on doing the same thing, but just plan on using twin blow up mattresses. The size is roughly 38" wide x 2 = 76". This would only leave 14" on a 90" wide interior. Seems small, just curious what you ended up with. We had foam custom cut to fit. Including the master bed. Thanks, I figured that was the case. Can you tell me approx. how much you spent for each custom foam piece? If I remember right it was $500 for the 4 bunks and the master bed. Hi! i'm trying to get a bus to convert myself. i'm wondering what you had to do to convert the registration from school bus to rv? i cannot find any info on that, and i'm not really looking to get a cdl. We are on our 2nd bluebird bus. 1st was front engine, new one is rear engine. MAKE SURE YOU LOOK UNDERNEATH FOR RUST ISSUE. Some of these busses ARE not structurally sound. That is why we bought ours fr om a dry area in the pacific NW. 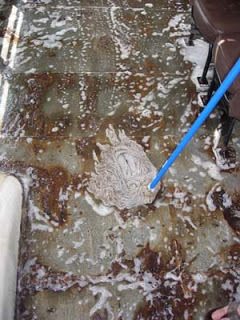 We are from MICHIGAN- DO not but a Midwest or east coast bus- unless you really inspect it for rust!!! Also if someone has 1 for sale in non rust belt make sure to ask them Where it came from. I have known people to but cheap rust bucket busses and then sell them from a non rust area. unsuspecting person does not realize the junk they may be buying. 3 K os way to much for a front engine. Rear engine 5-8k front eangnie 1500-2500. We initially paid 3500 for an already converted front engine. we paid 5K for unconverted rear engine with push button Allison. 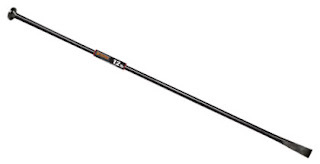 Oh by the way if in mountains DO NOT get a allsion 545. We about got killed between phoenix and flagstaff- 545 have NO engine braking. I really thought we were going to die at 2am going down a 10 mile step mountain- brakes burning and downshifting not helping. If not in mountains 545 ok. we have a 3060 ( it will go 75+ ( cnat say how fast but it was way way too fast when I did a test run to see how fast- way faster than 75 ( uphill and flat- going down went through mountains and didn't need to even downshift speed never went over 55 with no foot on accelerator or GAS. Sorry for the length but I felt these were important issues. Very nice conversion. I have done several that we have taken to Central and South America. I have one now and can not find anyone who will insure it, in fact when we were almost done insuring as an RV there was a specific check box that said:"This is not a converted school bus." It seem ironic as they are the safest vehicles on the road. Any help with companies who will insure this would be nice. Congratulations on your work of art on wheels. We have them both registered in California as "House Cars" (much cheaper than RV registrations and no luxury taxes.) As for insurance - Allstate covers both of them - but we just have liability on them. What type of paint did you use for the exterior of the bus and how did you apply it? Did you prime it first? We have our bus sanded down and ready for paint, just trying to figure out the best application without having to take to a professional to paint it. Were not looking for it to be perfect. Hello. GREAT blog! I'm wondering how fast you can comfortably drive on the freeway in the bus? Is the transmission geared for highway speeds? Thank you. I really want to model my bus after Thais one but can not find he dementions of any of rooms and cabinets/woodwork. Can you please tell me where to find them. I have to say I was truly inspired to buy a bus and convert it! I do have one question, I wasted to model my bus off of Good News but couldn't find any dimensions. Can you please tell me where I should look on your website to find them? WoW! amazing job! My hats off to you guys! I was curious who made the stove hood vent? I can almost make out the name on the front but not quite. Thx. Marcel...it is a 12V Baraldi Vent. Awesome conversion do you think you guys will convert other buses and sell them or rent them out. Where exactly is the washer and dryer...didnt say in the film? And is the only way to the storage area is through outside back door? What is stored there? And I am confused...is it run on gas or diesel? The washer/dryer is located in the rear storage of the bus. The storage area is accessed through the back and also through a hatch built into the book shelf in the master bedroom. We use the hatch as a laundry shoot. The bus runs on diesel. Keep your eye out for a new walk through video coming soon. We are working on having a professional floorpan done of the bus. Once it is ready we will post a link to it. We are also in the works of doing a full feature video walk through of the Good News Bus! I'm curious if you have done anything to muffle the engine noise. I have the same bus converted for my family, and one of the thing I find most annoying is needing to yell from the drivers seat to be heard from my family behind me. Did you do anything to solve this problem, or do you just live with it? RV America will not insure a converted school bus. Unfortunately i tried. Flat out no.